If any Indian film-maker has the vision, audacious imagination and almost Promethean ability to own the Bard on his own terms, it has to be the prodigiously talented Vishal Bharadwaj. Maqbool and Omkara have proved it beyond doubt. I will put my neck on the line: Vishal Bharadwaj is among the best in the world — and that includes Akira Kurosawa, who made the classic Throne of Blood — when it comes to giving a local habitation and name to Shakespeare’s great tragedies. Tragedy is more challenging because it demands true depth of emotion and matching dramaturgy. Shakespeare has been with us forever, it seems, invading and filling our colonised minds, displacing, in a way, the traditions of Natya Shastra when it comes to cinematic adaptation of classics. The challenge lies in finding cinematic equivalents for Shakespeare’s poetry: evocative mise-en-scène to convey the magic of words so well known that they are over- familiar to many of us and to carve out characters rooted in our soil so that we can relate to an Indianised Othello, Macbeth and Hamlet at a visceral level. 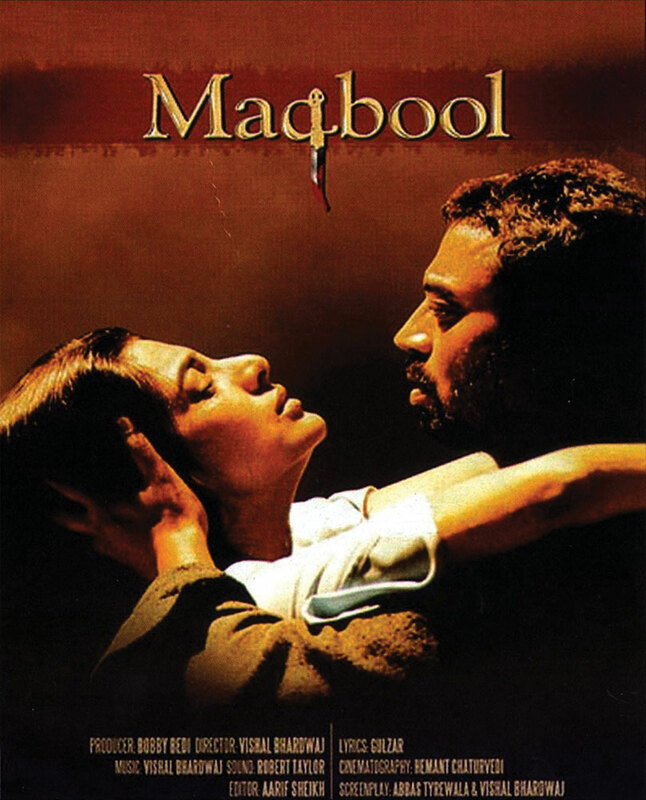 Bharadwaj’s Maqbool (2003) transposed Macbeth’s vaulting ambition to Mumbai’s underworld, playing upon graceful courtesies of Muslim society to give the film its structure, only to disrupt the foundations of trust on which the dramatic edifice is built. The supernatural — the cackling witches making dire predictions — has to not only be made credible but also updated to suit modern sensibilities. So, he comes up with the brilliant device of two corrupt cops — the trusted old pair of Naseeruddin Shah and Om Puri — as they run the gamut of astrological games with surreal glee. As for the malevolent genius of Lady Macbeth, we got Tabu as the young, much-indulged mistress of the elderly don, whom Pankaj Kapur plays in a Brandoesque performance. Irrfan Khan broods in eloquent silence, torn between loyalty to his mentor and love for Tabu, who has him in thrall. The apocalyptic ending has the sea surging behind blurry windows, threatening to engulf the guilty pair. Maqbool raised the bar for Shakespearean adaptations. Bharadwaj went one better with Omkara (2006). From the opening ballad dedicated to Omkara, the Bahubali’s prowess, to the whispery lullaby the warrior sings to his Dolly, who shimmers with translucent beauty, the musician in the director finds rhythms to match every mood. Ajay Devgn’s glowering silences and Saif Ali Khan’s Langda Tyagi’s loquacious, poisonous cynicism stand out against the convoluted plot that centres on the elaborate kamarpatti (jewelled belt) given to the new bride, who is not so bashful at all. While the raunchy ‘Beedi Jalai Le’ has the rambunctious men whooping and wildly dancing, the camera cuts to the quiet intimacy of the newly-weds, the kamar patti emphasizing Kareena Kapoor’s slender waist and undulating walk. The wide jhoola that sways to the lovers’ union becomes an important part of the mise-en-scène, rising above its functional duty as a prop. In the creaking sound of the jhoola and the broken fragments of the lullaby, once sung with inarticulate tenderness, now a whispered fragment tormented by anguished guilt, Bharadwaj finds the perfect cinematic equivalent to Othello’s soliloquy. This is where an earlier Indian version of Othello failed. Jayaraj, the much-feted Malayalam film-maker, had used the traditional dramatic form Theyyam in Kaliyattam (1997). The hero, Kannan, played by Suresh Gopi, is the principal character in the semi-religious performance while Iago’s counterpart is reduced to playing the clown. There is also caste hierarchy to ratchet up the conflict, not exactly mirroring the racist hostility to the virile Moor of the original, but emphasising the paradox of a lower-caste man playing the divine hero, aspiring to translate what happens in performance to real life. The low-caste Kannan has eloped with the demure Thamara, daughter of the village chief. Kaliyattam has astounding scenes full of colour and pageantry in which you see actors in full Theyyam regalia appear on a hillside to spellbinding effect. It is spectacle without emotion. The crucial piece of evidence that makes Othello damn Desdemona is the silk handkerchief. In Kaliyattam, Kannan and Thamara make love on a brightly coloured piece of cloth — a cross between a sheet and tablecloth — and rub faces daubed in haldikumkum hues as foreplay. It is too stagey, determined to wring out every possible drop of colour in the name of exotica, and comes out curiously pallid, devoid of passion. Traditional, gorgeous oil lamps are used effectively — if literally — for the put-out-the-light scene before Kannan smothers Thamara with a pillow. And, he dies walking on live coals and ritual fire as the Theyyam performance reaches its tragic climax. Kaliyattam was significant for the manner in which Jayaraj cast Othello into native mould, fusing traditional theatre form — which, if I am not mistaken, does not allow for the heroic demi-god to die at the end — with cinematic imagery. Jayaraj and Suresh Gopi won best director and best actor prizes respectively at the National Film Awards, 1997. Pankaj Butalia’s 1989 documentary When Hamlet Went to Mizoram was a revelation of how the Prince of Denmark’s tragedy was enacted, in bits and parts, all over Mizoram to appreciative audiences. It was as if the political climate of the time made Hamlet a Mizo. Thus, Bharadwaj’s choice of Kashmir for his version of Hamlet has a precedent. Othello seems to be an Indian favourite. Is it because our patriarchal culture is inherently full of jealous husbands doubting the chastity of their dutiful and beautiful wives? A throwback that resonates to Sita’s Agnipariksha? Something for scholars of comparative literature to chew their speculative cuds about. It is revealing how Othello insinuates itself into a period love story — in pre-Independence Calcutta — of two medical students who are divided by religion. Saptapadi (1961) is a beloved Uttam Kumar-Suchitra Sen hit directed by Ajoy Kar. He comes from an orthodox Brahmin family, and she is a modern Anglo-Indian girl. They meet, part and meet again after years of tearful sentimentality. What I remember the film for is the scenes from Othello the lead pair enact for a college function. It is all in English, and this section was directed by Utpal Dutt, who was far more famous for his stage performances. Dutt and Jennifer Kapoor’s voice-overs (Othello and Desdemona) reverberate with all the passion demanded of them while Bengal’s golden pair emote through body language, aided by a camera that moves from extreme close-up to mid-shot with the kind of fluidity that creates cinema out of a stage performance. The film is worth seeing just for this remarkable sequence, quite unparalleled in Indian cinema. There is yet another faithful rendition of Hamlet, by Kishore Sahu in 1954. Named Hamlet, it is Parsi theatre on screen. The language doesn’t aim to recast Shakespeare’s words into Urdu cadences. Names are as they are in the original, and costumes are what pass for Elizabethan. The opening shots of castle ramparts with mists swirling around shadowy dark figures remind you of Lawrence Olivier’s Hamlet from 1948. Sahu’s courage of playing Hamlet and directing the film in a year in which Nagin was the biggest hit is commendable. But, the commendation comes to a stop when Mala Sinha’s Ophelia breaks out into a regular song and dance, twirling the hem of her long white gown, to lure a brooding Hamlet out of his black sulks. I stopped watching at that point. For anyone interested, this curiosity is available on YouTube. It is surprising that in a film industry in which lost-and-found brothers is such a perennial formula, there have not been that many takers for The Comedy of Errors. Bimal Roy’s little-known 1968 adaptation, Do Dooni Char (released in 1968, three years after the producer’s death ) directed by DebuSen, had an interesting cast consisting of Kishore Kumar, Tanuja and Asit Sen. But, DVDs of the film are unavailable for love or money. Gulzar, who wrote Do Dooni Char, remade it as Angoor in 1982, with Sanjeev Kumar, Deven Verma, Moushmi Chatterjee and Deepti Naval. 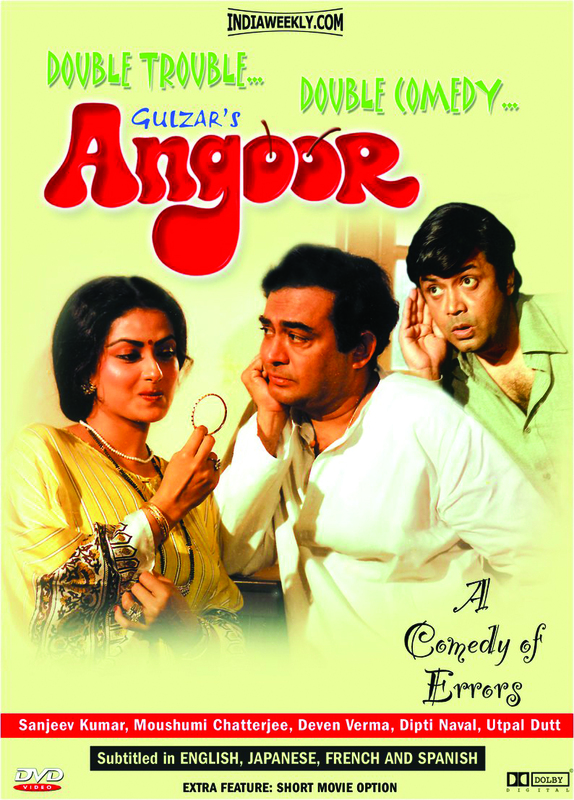 Uproarious situational comedy leavened with Sanjeev Kumar’s superb timing and sotto-voce delivery of punch lines makes Angoor one of the best Indian comedies. Perhaps, Sajid Khan ought to see this film before he embarks on quadrupling lookalikes for his next caper. It is said Merchant of Venice is the most popular play with theatre groups. But, as far as films are concerned, Romeo and Juliet is the perennial source of variations on the theme of star-crossed lovers. We have caste, sub-caste, class, religion, politics, regional identities, ethnicities — the list can go on — as insuperable barriers to young love. Aamir Khan’s 1988 debut blockbuster Qayamat Se Qayamat floundered against Rajput pride in Thakurland for a sweet, almost passionless tragedy. The more recent Ishaqzaade (2012), with Arjun Kapoor and Parineeti Chopra, was more meaty. The girl had raw passion and pride while guns blazed in UP’s badlands, where the families were not only divided by religion but belonged to rival political parties. Sanjay Leela Bhansali’s awkwardly named Goliyon Ki Raasleela Ram-Leela acknowledged Shakespearean source — for once by its self-anointed auteur director — while the love story burst into colour and outpouring of strutting emotions, revelling in ethnic extravaganza. Bhansali used rhyming couplets in SMS language to add piquancy. Perhaps, this is closest Indian cinema has come to Baz Luhrmann’s definitive reworking, Romeo+ Juliet (1996), which was set in the fictional Verona Beach — it looked very Southern California — and had the opposing families as arch business rivals. Luhrmann went on to win a Berlin Gold Bear. There are sure to be many desi variations on this surefire theme, but how many will be able to make the leap to international success is a moot point. With Shakespeare, Bharadwaj is our best bet to pull off a convoluted creative leap: Indianise an Elizabethan classic and yet universalise it enough to travel to other cultures.